Episode 9 features an interview with Dr. Mike Bixenman. 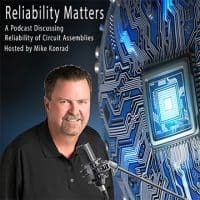 We’ll be talking about cleaning for reliability, challenging components and fluxes, methods to determine how clean is clean enough, and how and why he co-founded Kyzen Corporation. Mike is one of the founders of Kyzen Corporation and serves as its Chief Technology Officer. Mike is well known within the electronic assembly industry and is a featured speaker at industry conferences and symposiums around the world. Mike is the Chair of the IPC Cleaning and Coating Conference held once every two years in Chicago and is the Technical Chair for SMTA Europe’s Electronics in Harsh Environments Conference held annually in Amsterdam. Mike has also received the IPC President’s Award and has chaired the IPC Cleaning Handbook Task Group.